Prospective NFL players might want to skip tryouts and the Combine, when all you have to do is post up outside the teams complex. 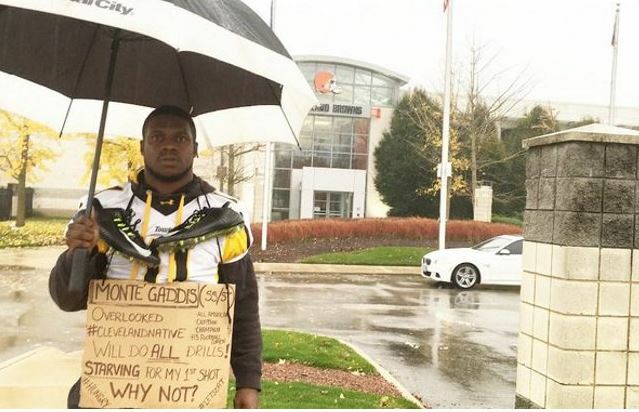 Monte Gaddis just joined the growing list of aspiring NFL players, camping outside of organizations' complexes. “I have a lot of cars driving by wanting to know what’s going on, what does the sign say,” says Monte Gaddis, of Cleveland. Gaddis says he’s been walking up and down the sidewalk outside the Browns headquarters in Berea for three straight days. He’s wearing a sign around his neck that reads, "Starving for my first shot, why not?" “I just have confidence in myself that I know I can make this team and maybe change things around,” the 23-year-old Gaddis said. At 5-foot-11 and 210 pounds, Gaddis is trying to get a tryout with the Cleveland Browns at running back. Gaddis was a walk-on at the University of Maryland and ended up being an All-American in 2012 at Towson. a defensive MVP in 2013 and even played in the FCS Championship. Monte’s perseverance finally paid off: Browns GM Ray Farmer came out of the facility for a private meeting with the Cleveland native. Now we wait for the tryout.